The manufacturing process begins with an onsite visit from one of our experienced salespersons. 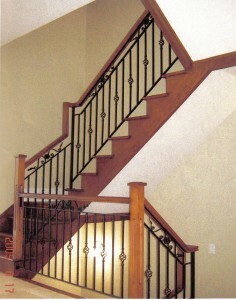 Our salesperson takes accurate final measurements and because all of our staircases are custom-built, we design the staircases to suit your needs and your stairwell. 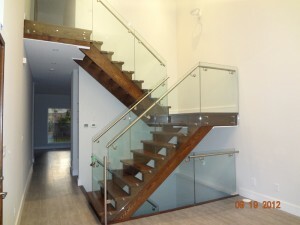 We use only the top quality lumber to build our stairs, but this lumber needs to be surfaced and imperfections cut out in order to provide the best appearance to the staircase. Once the lumber is surfaced, it is arranged into panels to use for stringers and treads. The panels are then cut to the required size needed for the stringers and treads. Our stringers are taken to the stringers department where they are precisely laid out and either cut or routed (open or closed stringers) and sanded. The panel that are to be made into treads follow a similar process where they are laid out and cut into the required size and shape to match the style of staircase. Most of our risers are either plywood with particle board veneered with the requisite material. 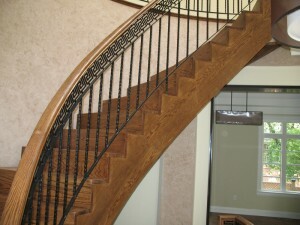 Some styles of staircase are built with solid wood risers, those follow the same steps as the treads. The stringers, risers and treads are taken to our assembly department where they are painstakingly constructed into the desired staircase. After the product is assembled it is meticulously sanded and wrapped using a clear plastic underneath and rip proof plastic on top of which we attach 1/4” plywood to protect the treads during the construction process. The stairs are then loaded onto our delivery truck, taken to the project and carefully installed by our qualified installers.